Hartley’s Jelly has launched its first ever TV ad, with a comically surreal new spot for its Hartley’s Jelly Pots brand featuring a group of mischievous jellies trying to escape toys who are working together to put them into their pots. 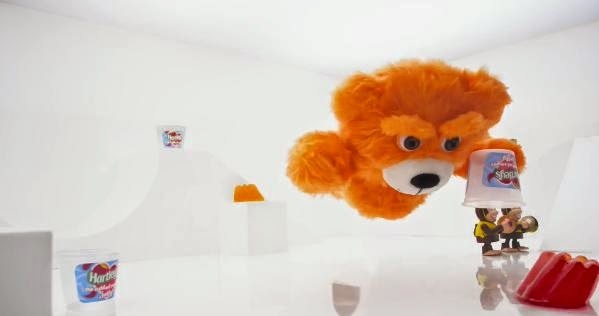 The ad, created by Karmarama, shows the jellies wobbling around whilst lots of different toys, including a big orange teddy bear, a giraffe, a dinosaur and toy diggers, chase after them. The jellies that appear in the ad are the real thing and were made to wobble and move through puppeteering techniques. The weird and wonderful jelly voices were provided by both professional beatboxers and comedians. The toys were brought to life via a combination of stop motion and puppetry. Both were combined to produce a visually arresting and entertaining piece of action. The ad was created by Tom Woodington and Robin Temple at Karmarama. It was directed by Chris Cairns through Partizan.